One hardly needs to introduce "Saya no Uta" - after all it is one of the most famous visual novels in the West and for good reason. No, shock value is not that reason, but rather the fact that it is a brilliantly written little piece of fiction that while being quite short still manages to pack a real emotional punch. -Howard Phillips Lovecraft "The Call of Cthulhu"
Just as pure oxygen is harmful to the body, the naked truth has the power to destroy men's minds. Only by diluting it with lies and taking it in small doses can humans maintain a healthy soul. What a pretty mug you have, grandma! The protagonist of this work is one Sakisaka Fuminori - formerly a medical student who, after surviving a horrific auto-accident, starts withdrawing from society and slipping into madness. There is a reason for that - neurosurgery that saved his life also irreparably changed his perception of reality. To Fuminori the surroundings look as if covered in blood and guts, worms wriggle beneath his feet and all the human beings look like horrific monstrosities. That is, all but one. One night Sakisaka is visited by a young girl in white that becomes his anchor in the world gone insane. She claims her name is Saya and Fuminori's conversations with her is the only thing that keeps him from committing suicide out of despair. This is not my first time playing this masterpiece. Back in 2009 I completed the game with a fan-patch and was absolutely floored by the story. 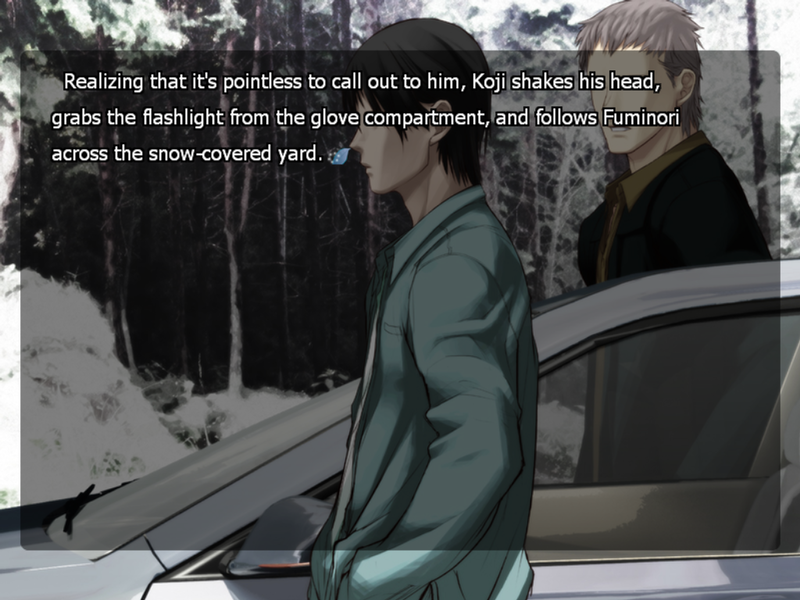 When I reviewed "Nocturnal Illusion", I talked about the staying power of that visual novel and exactly the same can be said about "Saya".Apparently I haven't forgotten a thing and booting the game again felt like slipping into familiar and well worn clothes. The fact that I remembered all the events of the game didn't diminish my experience in the least - after all, good games are not meant to be played only once. Moreover, this official release by JAST USA is a bit different. According to its translator Makoto, the script has been updated and is better than the one used in the fan-patch. Of course, I cannot tell the difference as it's been four years since my first playthrough, but I'll take his word for it. At the very least, I can honestly say that the story flows beautifully and it's obvious that Makoto is not only a good translator but a good writer too. The only thing that I noticed, was the absence of honorifics. I cannot remember if they were used in the previous version of the translation and I didn't really miss them, but I usually like to have them in the stories set in Japan. In this world, reality is what the majority says it is, and I had the misfortune to step outside of that box. "Saya no Uta" was written and directed by Urobuchi Gen whose staple is really dark stories (he is not called "Butcher" in Japan for nothing). And it hardly gets darker than this as "Saya" is Urobuchi's love letter to Howard Phillips Lovecraft. 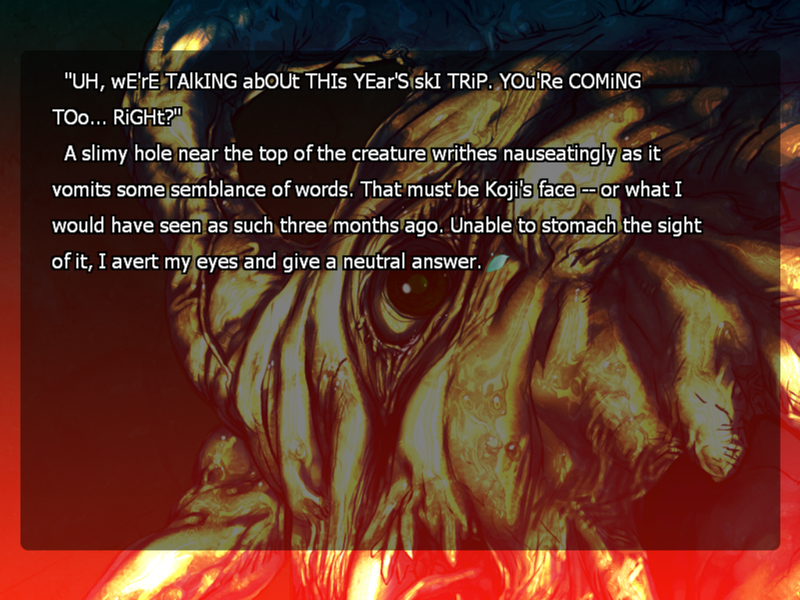 Gen is a self professed Lovecraft fan and in this visual novel he examines many of the themes prevalent in the grandmaster's works: the fragile boundaries of sanity, the hidden worlds veiled from our sight, the consensus realities and limited scope of human perceptions that can never comprehend the true nature of the Universe. 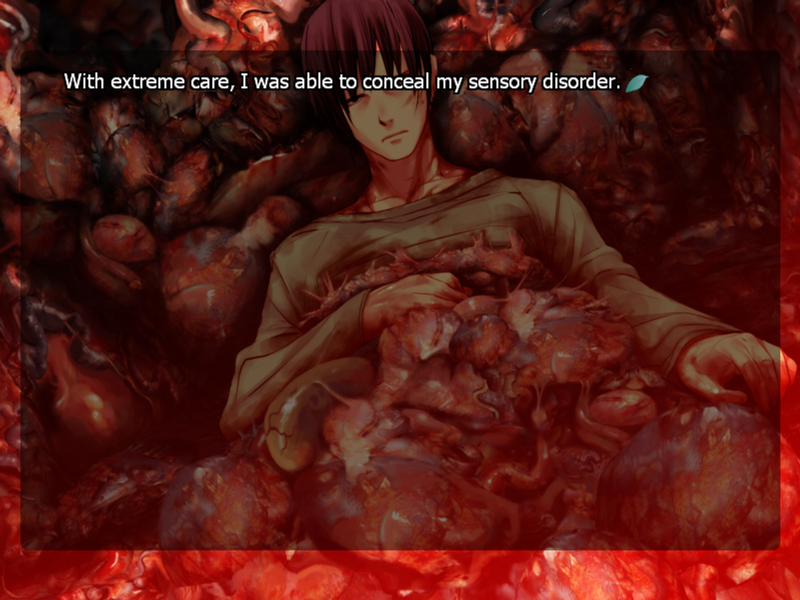 "Saya no Uta" derives influence from a number of HPL tales, with one of the main characters, Koji, sharing many similarities with Dr. Willet from "The Case of Charles Dexter Ward". 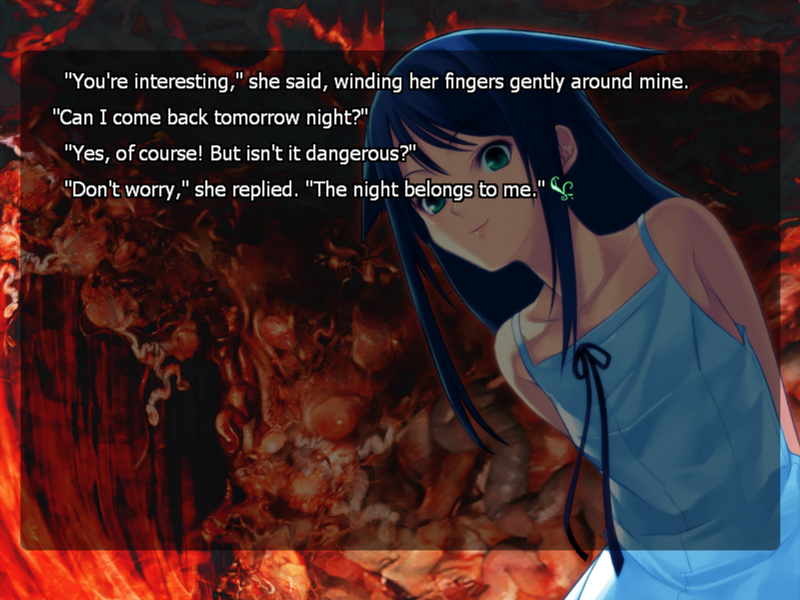 Despite clear Lovecraft connections, my personal belief is that "Saya no Uta" pays a much more obvious homage to a 1959 short story "The Blue Lenses" by Daphne Du Maurier. I refuse to believe that Gen hasn't read that story, as the premise in both works is almost identical; it's what stems from the premise that is vastly different. SnU is a cosmic horror story, it's an utsuge too, but ultimately it is also one thing that Lovecraft has never written - a love story (unless you count "Sweet Ermengarde" to be that :-D). The darkest one ever told... Also "Saya" is a story of personal growth, but where majority of the stories envision the growth happening toward the light, Fuminori strives for the darkness as we follow his descent into a role of a villain protagonist. And there lies one of the things that makes this game unique not only among visual novels, but also among literature in general - it's so rare to see the world through the point of view of a villain. Sure, there are plenty nukiges that feature rapists as the protagonists, but when was the last time you played a villain in a story heavy game? How wicked and terrible Saya is. Perhaps others would fear and loathe her. I, however, find her malevolence irresistibly charming. Doesn't look like a standard hospital bed. Sakisaka Fuminori doesn't start as a bad guy. He is seriously mentally disturbed and is an unwilling sociopath courtesy of his injury, but he is a fairly sympathetic person struggling to make the best out of his situation. We are forced to watch everything crumble around him and are finally asked to choose betwixt his former world or the new nightmare and it is obvious that we are gonna stay with Saya, as by that time she becomes an inseparable part of his life. Even after Fuminori crosses the Moral Event Horizon we still cannot help but side with him. After all, he only wanted to live in his own personal little world with the person he loves. It's not really his fault that the said world is in direct opposition to what the society at large considers acceptable. It's a testament to Urobuchi's strength as a writer that he makes Fuminori actually likable and relatable from beginning to the end. Saya is one of the greatest video game heroines of all times. From the very start she is Fuminori's support, but unbeknownst to him, he is also supporting her. Saya is alone and scared of the supposed "role" that evolution entrusted to her and all she wants is to be loved. If we are to believe her surrogate father Masahiko Ougai, he considers her damaged goods as he believes to have inadvertently ruined her. Saya finds acceptance and much more in Fuminori and finally proves her "father" wrong by finally reacquiring her purpose in life. As a person she is fickle and energetic, frequently displaying instances of Blue and Orange Morality that exasperate even Fuminori. Most frighteningly she is a being without malice and that is the most dangerous thing about her. The love of this unlikely pair burns hot and short, but leaves a lasting impression. You mean, she's a party animal? The third most important person in this story is probably Tonoh Koji - a former friend and eventually an archenemy of Fuminori. 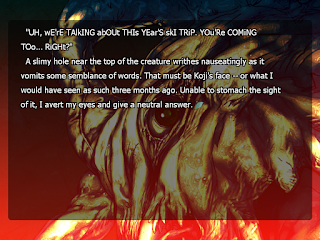 Koji is a bona fide traditional Lovecraftian protagonist, getting entangled in things that are far beyond his understanding and eventually sacrificing his sanity on the altar of truth. Halfway through the game he becomes a secondary protagonist and a heroic antagonist to Sakisaka. The POW sometimes switches away from Fuminori and Koji is not the only one with an alternative point of view. Those third person scenes are strangely normal and in stark contrast to the constant delusion Fuminori is living in. Once you have glimpsed even the tiniest fraction of the world's true face, you have no choice but to watch in horror as the veil rolls itself back inch by inch. Graphically the game is quite simplistic and does not show anything fancy, but I have come to believe that horror works best when it's graphical representation is fairly minimalistic. That's not to say that the game is not good looking - it is, but one cannot forget that it was made ten years ago. On the other hand, the soundtrack is phenomenal. I feel ashamed that I have forgotten how good the music in SnU is. The novel is also fully voiced and the voices are quite good, but they pale against the soundtrack. I wonder about the physical aspect of this union... and then I don't. SnU is a pretty short novel and clocks in just around 6-7 hours. There are only two choices and they lead to three different endings. Such characteristics are not the weakness, but the greatest strength here. There is no filler material and the plot moves at a brisk pace without letting up an emotion barrage. And those that want some more of "Saya" goodness might want to try an American comic book based on the game... Wait, what!? Yes, dear Sayaphiles, there is one and it's but a mediocre effort to capture the beauty of Urobuchi's prose. OK, let me get it out of the way - I quite liked the art in the books (there are three volumes) and it quite captured the feel of the game, but there were a few core problems with the premise. First of all, the visual novel portrayed ordinary people caught in extraordinary circumstances and and becoming victims of a cosmic bad luck. However the comic had to turn it all into a vast conspiracy. In my not so humble opinion it devalued the people involved and Saya herself. Second and probably the biggest problem is that Josh (that's Fuminori's expy in the books) and Saya are good guys. No, really! Instead of trying to deal with a moral ambiguity, the authors turned the comics into a traditional "good vs evil" action schlock, which I frankly find insulting. And finally the ending doesn't make any sense. It's based on the True Ending of the VN, but it's so out of context in the graphic novels that it feels that the authors ran out of ideas in the end. Natheless, the comics are quite short and if you have some time you might think of downloading them and checking for yourselves. Life is like a journey anyway. Nothing stays the same forever. The only difference is whether time passes you by or sweeps you up in its flow. Dr. Tanbo - eternal optimist. 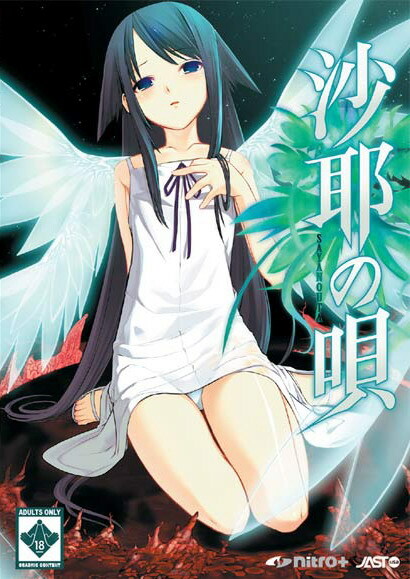 To sum all this rumbling, "Saya no Uta" is a masterpiece of short fiction in general and of horror genre in particular. I might not find it particularly scary, but it's certainly uncanny and forces to think, especially about such topics as finding your place in the world and the hold that our brains keep over that precious thing called perception of reality and how that perception might change between different groups. It's a title that I would recommend for everyone. Buy the official English physical release at: JAST USA, J-list, Rightstuf. Buy the official English digital release at: JAST USA, J-list. Buy the Japanese physical release at: J-list, Paletweb. Recommended reading: The Blue Lenses. As you said, it is a surprise how you defend their love once you finish reading. One particular scene (and SPOILERS ahead) is in Kouji's ending, when he is madly finishing off Saya who is desperately trying to reach for the corpse of Fuminori, and you can only see Kouji as the bad guy getting in the middle of that love. For me one of the best scenes. And really one of the best soundtracks in a game, especially Saya no Uta I and II.